Church has a knitting group! Now I should have know this, but some how I did not. I found out about the group but accident. Bizy-girl (aka Bean, aka Curly) wore a hand knit dress to church a few weeks ago. It's knit up in a dark blue, all cotton yarn. Very cute orange flower buttons finish off the faux wrap style of the top. She looked adorable! My sister in-law knit it for Biz's first birthday. SIL is a fantastic knitter who turns out fabulous project after project. I'm a little envious of this, as I barely have time to finish a cup of coffee, let alone a project. Between choosing colleges with Soccer Chica, keeping a 2nd grade boy out of trouble, and changing a 15 month old baby (really the biggest challenge of them all) I can't seen to remember to breath. It' a good thing that breathing is not optional. Well, while one of the church ladies was admiring the dress, she asked me if I knit it. For a split second I wanted to say "Why yes, yes, I did." Then I remembered where I was and I didn't want to hurt SIL feelings. Would she ever know? No. But I would know. And it would be wrong. Not to mention the ramifications of fibbing in church. Drat those morals. Anyhow, she commenced to invite me to the prayer shawl group! 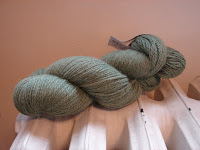 I was so excited that I just had to go out an purchase new supplies to knit my very own prayer shawl. So I bought a pattern by Kristin Ohmadal for a scalloped lace edged shawl and some alpaca sock yarn by Classic Elite Yarns in a nice green. I really wanted a soft gray, but could find anything in my price rangethat I was in love with. Now I purchased it all at Your Local Yarn Shop here in Battle Creek. Did I ever mentioned that this shop is within walking distance of my home and work? How dangerous is that?! The gal who helped me was sweet and knew that I was struggling with my choices. She definitely had patience. I am a little over half way done with the knitting. 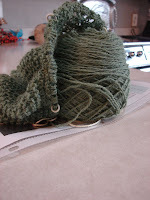 At this point it looks like I have knit a large, moldy dish cloth. But I know that the shawl will block out lovely, so I am not discouraged.